You can choose to move the drones individually (if your video feed still works that is) or you can type in commands to get your drones to move or use your mods. So there you are in space… some kind of apocalypse event happened and you are traveling the universe in search for answers, fuel and scrap metal for your journey to… wherever the heck you are supposed to end up. You start out with four drones equipped with different abilities. Some of these abilities are super useful while other abilities and their usefulness lies hidden in a tactic that you haven’t either needed to explore yet or can’t fathom. Either way, in your exploring you’ll find other abilities that can be towed back (if you’ve got that mod) to your ship or picked up off of dead drones (God rest their little metal ghosts). They say you’ll get attached to your drones. This is true for some, but I think in my own way I’m only attached to their usefulness to me. 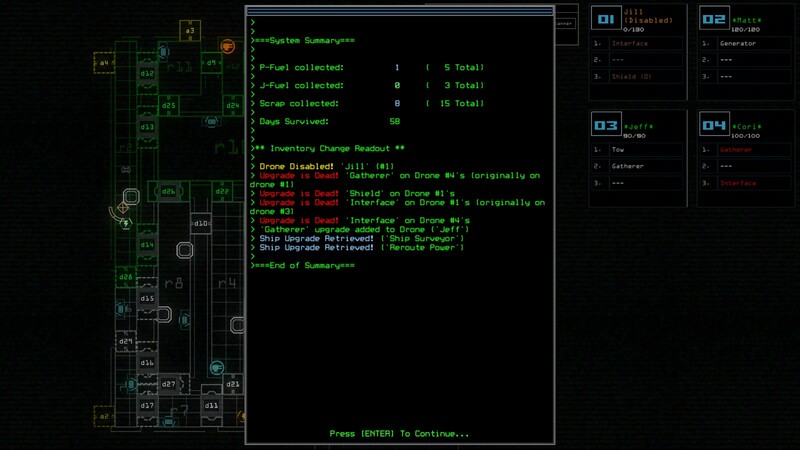 Let’s say I’ve got a drone named Lucy and she has my Gather mod and experiences “death by a turret” (or a bunch of deadly red blocks or radiation or an air lock and on and on…) while exploring; in all these cases but the last, I can take a drone in and swap out another mod for it or just straight take it. I’ve gotten used to only having a few mods on each drone (since some mods have failed me). I can leave Lucy to lay lifeless on the floor since I’ve got what I need now. This may seem heartless, but if you don’t steel yourself for the cold, hard truth of this lifeless universe, you may find yourself crying from time to time. Duskers‘ cause (whatever it is) needs you to be strong! Leave no useful mod behind, but a drone… well you can’t drag a dead one anyway so get over it. This is a good example of how everything can just go wrong. I went into this mission with everything going well. I proceeded to lose Jill, all of her stuff broke and five mods on two other drones were starting to malfunction… all in one mission. Argh! On and on you explore different ships of multiple sizes and setups that will have you watching which doors you open and running from unknown enemies. It’s fun to make it out with your salvage, but I’ve not quite figured out how to scout a ship for 100% of its supplies successfully yet. I’m always leaving a ton of useful salvage according to the mission summary report at the end. That’s not to say I haven’t uncovered the whole ship, but my ability to see everything is not 100% somehow. It’s like I’m missing a mod that sees secrets. I’ll get it eventually right…. right? It’s eerie, mysterious, exciting, fun and extremely frustrating at times (although they may have patched some of the “your everything on your everyone just broke” out of the game recently). 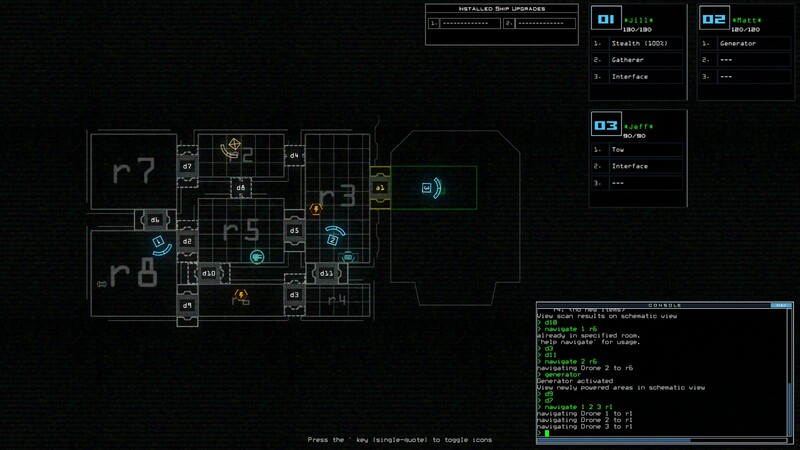 I do enjoy Duskers and would recommend it to those who like a bit of thinking in their games. If you like games that can’t really compare much with anything else: Duskers! 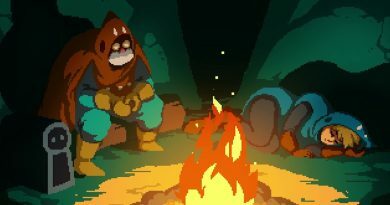 Really, I’ve not played anything else that really gives the same feeling and games like Duskers are the reason indie games are home to some of the best gaming experiences out there today. Now if you don’t mind, I’ll just get back to guiding my drones to their deaths. After all, if you love something, you’ve got to let it go.